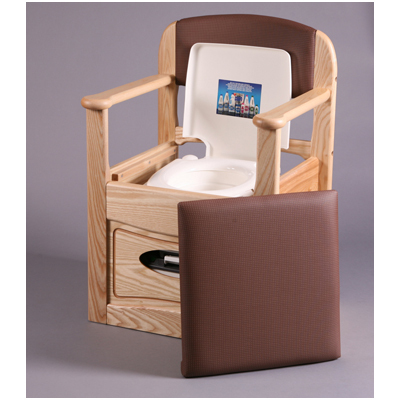 The Royale Flushing Commode is an attractive hardwood framed traditional styled chair that has the added benefit of doubling as a portable, hygienic, flushing toilet. The backrest and seat are padded with vinyl which enhance the chairs appearance as a normal piece of household furniture. There are two detachable sections, the upper section is a combined flush tank and toilet bowl with a removeable toilet seat and lid. The lower section is a waste tank. Waste is forced down into the waste tank by a flushing system that is activated by a plunger mechanism. Chemicals in the tank break down any solids and also destroy any unpleasant odours. 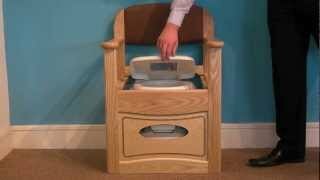 Waste disposal is simple by sliding the tank from the commode base.